Specializing in Australian black opals direct from Opal fields and including opals from all over Australian opal fields in boulder opal fields to Coober Pedy opal fields. Specializing in gemstones from gemstone wholesalers all over the world, offering gemstones at wholesale trade prices. Coins AuctionedSpecializing in coins from all over the world. Authorised distributor for Perth Mint Coins in Australia. Strong variety of silver coins from one ounce to one kilo silver coins. Treasures of the world idea was conceived as many of the worlds opal mines are not producing the quantity as in the past and we now consider as Treasures. Australian opal mines are producing less and only Ethiopian opal mines are producing commercial quantities. Our online sites are managed by Verified sellers who have product knowledge above the average online opal seller so buyers have confidence . 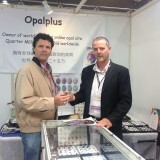 Our Opal Sheriff helps keep sellers up to date about any Opal Treatments such as smoked opals.